The first day of summer just passed and I was sitting on my back porch taking stock of my garden. Why? Well, I just registered the yard with the National Wildlife Federation. I will actually get a plaque for the front yard. The questionnaire made me realize what I really had here, even with almost half of the garden area under tarps. One whole side of the garden was so choked with waist-high weeds this year, and considering the chiggers of last year, that I just covered it with the old pool cover, weighted it down with rocks, and let it go. I rolled back a part of it this week and it looks about ready to replant. I will just do a little at a time, being a 70+ year-old gardener. Then I can move, as with the iris which need to be split this year, or plant with the seeds I bought for a butterfly garden. It wasn't until I did the National Wildlife Federation questionnaire that I realized all the items I have that are on the list of wildlife attractants. I counted 3 suet feeders, a triple thistle seed feeder, a sunflower feeder, Hummingbird feeder, and a dish for oranges for the orioles. I also counted 4 birdbaths and a fountain. Add to that the hedgerow across the back for shelter and the two big spruce trees for nesting and you have a yard that qualifies. I have been a lifelong hockey fan, specifically, the Detroit Red Wings. I remember listening to games on a little radio until I fell asleep in my bed. I remember listening to the New Years Eve games. Later in my life, I actually went to games at The Olympia for many years. Even later, I attended games from a suite in the Joe Lewis Arena with my Dear as guests of auto suppliers. My Middle School Students often saw this Red Wing player or that in the halls of the school as the mother of one was a secretary and others had homes in the area or were visiting parents who lived in the area. In fact, the mother of one of the Wings had been my Matron of Honor at my wedding in the early 60s. During the Stanley Cup Play-offs to this day, everything revolves around the games. Our whole block stops dead during play, although it can get a little rowdy between periods. Yes, it is Red Wing Country, indeed. But today it is a little subdued and sad as our beloved Wings lost the final game of the Stanley Cup playoffs 2-1 to the Penguins. 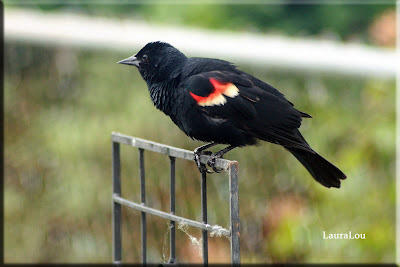 Even my 6 year old granddaughter had Wing Fever so she was absolutely delighted when I identified this visitor to my garden as a Red Wing Blackbird. It has only been the last year that this family of Red Wings have visited my feeders. 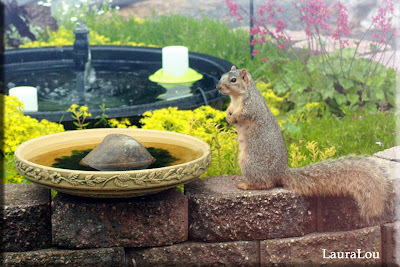 I really HAD to include this photo of one of the squirrels who visits the various birdbaths in the garden. My granddaughters will just get as excited over this squirrel as anything that visits us. Ok, maybe rabbits and squirrels are not egrets and alligators, but there is something about these frequent visitors to my garden in the North that is charming just the same. Watching my two little granddaughters "Shhhh" over even the most common visitors and seeing the wildlife through their eyes is magical. The last two days I have noticed this little guy at my black-oil-sunflower-seed feeder. In fact, he comes right in even when I am gardening really near by. I figured one time I was less than 6 feet away. 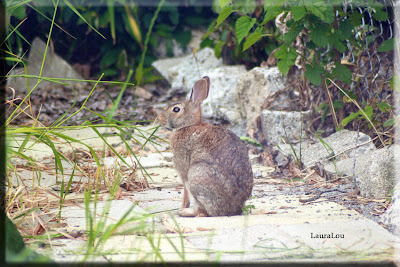 So this morning, I grabbed my camera and sat quietly on the back porch. Sure enough, in a few minutes he was right there and I was able to snap away. This is when having a silent mode on your digital camera helps. This layout of my garden makes it look a lot better than it really is. Returning North after the Winter in Florida allowed the weeds to take over any area not closely planted. The rose garden and iris are in pretty good shape, and I have dug the annual garden at the back (around the little statue). The garden around the pond is so closely planted that weeds are rare. What you can't see is the East side garden which is covered with the old black plastic pool cover. The weeds and grass were up to my neck! I had two years fighting chiggers and will NOT sit down and start weeding again so I just covered the whole thing. I said goodbye to the Astilbe, Philipandula, and Saxifragia. They can be replaced easier than weeding would be. By the time my son can come and rototil the garden the weeds should be dead. Then I will recover and plant just one section at a time. This time I will put the plants closer together and use a lot of Preen. These two weeks I am taking care of my 6-year-old granddaughter during the day. She loves gardening with me and has helped groom the rose garden and the path. Then Amazon delivered my copy of "Best-Ever Backyard Birding Tips-Hundreds of Easy Ways to Attract the Birds You Love to Watch". She read parts of it and I read other interesting tips. We started by digging out all the birdbath dishes hidden in the closets and garage and setting them up. Birds came from all over! There already is a fountain bubbling in the middle of the garden, and a table-top fountain on the deck. Very popular, especially with all of the young birds! Then we dug out all of the feeders and hangers. We washed up the feeders just as they say to do in the book. We don't have a birding store anywhere near, though. We settled for Aco Hardware and were very picky. ONLY Nijer seed and shelled black oil sunflower seed. 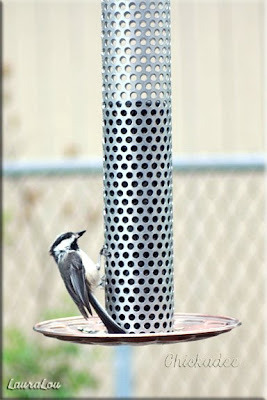 Now there are 4 seed feeders, one with 3 tubes. Unfortunately, the black birds are all over the feeders and the other birds are only here when the bully birds move on. The Baltimore Orioles are liking the oranges but no traffic to the hummingbird feeder that I can see so far. The back fence behind my garden is quite covered with forsythia, wild grape, yellow lilies, and weed-trees. This usually drives me crazy as I try to keep my side cut back to the fence, but I am aware that it offers privacy. The book, however, says a hedgerow is the first and most important feature to consider when making a yard friendly to birds. HA! I already HAVE that! And the two evergreens, which I considered cutting down, offer nesting and shelter. Now I am looking at planting bird and butterfly friendly plants in that long garden, once all of the weeds are gone for good. The book will be handy for deciding just what to plant. 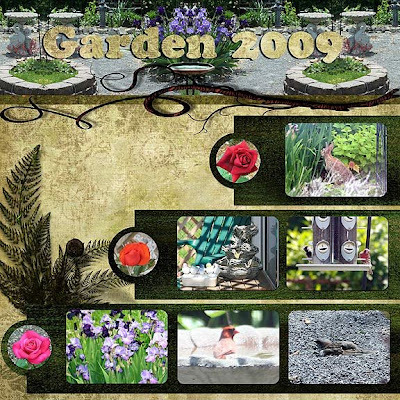 My granddaughter and I also ordered seeds for the annual flower garden, and vegetable garden from Renee's Garden Seeds and Park Seeds. I found a short full size flower zinnia at Park as suggested by a gardening friend. It is called Magellan. I also ordered Angel's Trumpet Ballerina Yellow. I hope they will flourish on my trellis. Renee's had collections of seeds and I ordered the Children's collection and the Bird and Butterfly collection. Time will tell how well these do in my yard but I really am hopeful. The zinnias from Renee's have done really well for two years. Watch here and I will show the gardens after they start to come up.